Congratulations! You’re joining the future of smart watering with Rachio and New York American Water. When your controller arrives, follow our steps below to install yourself, or see below for a list of Certified Rachio Pros in your area. Install your new controller in 30 minutes or less, no special tools or equipment required. 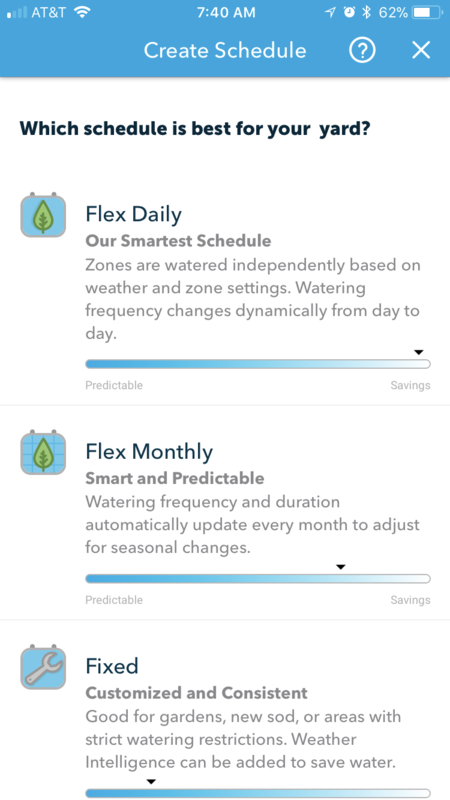 Check out the Rachio 3 Quick Start Guide to get set up, and our Schedule Set-Up Guide to maximize water savings. If your unit is outdoors, you will need to purchase a Rachio Outdoor Enclosure to protect your controller from the elements. We’ve partnered with Certified Rachio Pros in your area to offer exclusive pricing for services. Please use the list below to contact a professional directly. You must be present for the installation. Estimated completion time is 1-3 hours. These are estimated prices based on a traditional installation. If additional installation needs are required, the Certified Rachio Pro will provide a quote. Five Towns Sprinkler Service Inc.
For more information about irrigation assessments, please email nyamwater@rachio.com. Once you’ve scheduled your installation appointment with a Certified Rachio Pro, please follow the steps below before your appointment to ensure a smooth process. Wi-Fi credentials are required to connect the controller to your Wi-Fi network. Please make sure you have this information handy before your Certified Rachio Pro arrives. Create your Rachio account at app.rach.io by selecting "Don’t Have Account". Use whichever email you prefer. Download the Rachio app on your phone before your appointment. The app can be downloaded on the App Store and Google Play Store. Begin by selecting “Setup Zones” during controller setup. The app will work its way through all of your zones, beginning with zone 1. The app will initiate a 60-second countdown and you will be asked “is Zone 1 watering?” Click YES if your sprinklers are running. Click NO if the sprinklers in that zone don’t turn on. Note: Selecting DISABLE hides the zone from view; it will not be available when adding a watering schedule. Select this if you don’t have sprinklers in this zone (for example, if you have 7 zones on an 8 zone controller, you would disable zone 8). Next, it’s time to configure your zones! First, name your zone and add a photo for easier identification. Make sure your zone name is easily identifiable. Based on your location, we’ll select a default vegetation type. If this is incorrect, please choose another option. Select your sprinkler head type. Most systems use rotor heads and fixed spray heads. Rotors are used to cover larger areas, like front and back yards. Sprays are used to cover smaller distances, like side yards. Each zone should only have one type of sprinkler head. Speak with an irrigation company if you find zones with more than one type. To learn more about installation or get in touch with a Certified Rachio Pro, click here. Based on your location, we’ll select a default soil type. The soil in your area is mainly sandy loam, but if you know that is incorrect, feel free to choose another option. Note: If you notice your lawn isn’t getting enough water, you may want to take another look into your soil type and adjust in the app. Select your lawn’s sun exposure. How much sun does this zone get? A lot of sun, some sun, a lot of shade, or mostly shade? Next, you’ll want to select the slope of this zone to make sure you’re watering the perfect amount to avoid runoff. Is this zone flat, or does it have a slight, moderate, or steep slope? Rinse and repeat! You’ll repeat these steps for all of the zones you’ve enabled. If you’d like to see the attributes of your zone again you can head to the Zones tab > Select “Setup Zones” at the top right to go through the setup process again. For more information on zone setup, click here. Nassau County is subject to odd/even watering restrictions. The guidance below provides information on how to set up an efficient schedule that abides by these restrictions. With Rachio 3, you cannot edit the watering interval after the schedule is created. 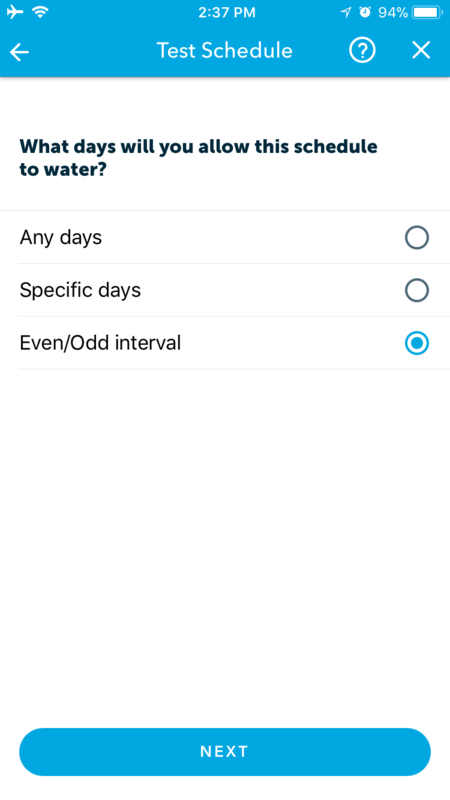 To edit, you would need to create a new schedule and select the appropriate interval (see below). 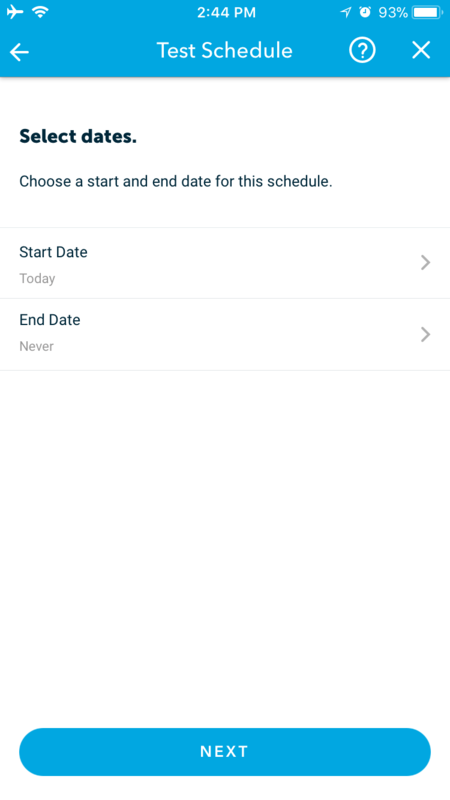 In the Rachio app, select the “Schedule” tab and then tap the blue plus sign to create a new schedule. 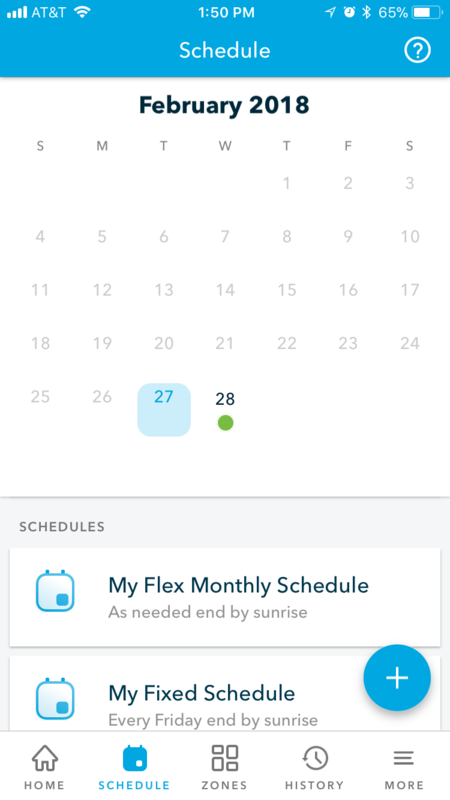 Select your schedule type (Flex Monthly). When asked “Which days are you permitted to water?”, select “Even/Odd interval” and click “Next”. If your home address is an even number, select “Even days”; if your home address is an odd number, select “Odd days”; if your home does not have an address number, select "Even days." 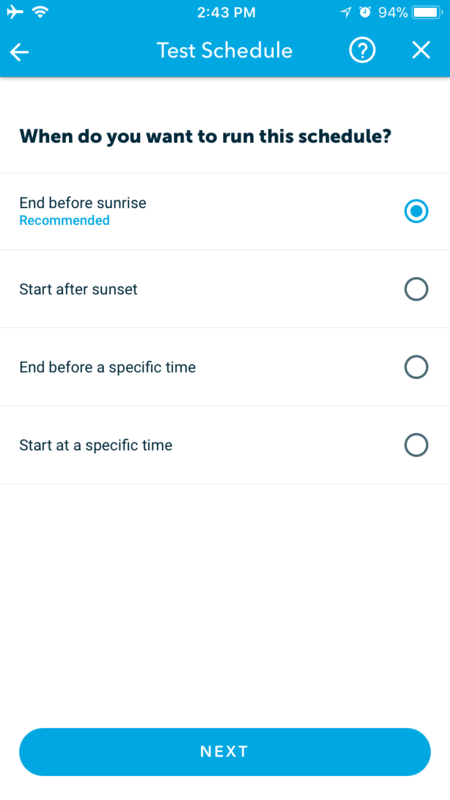 When deciding when to run the schedule select "Start At A Specific Time” and choose a start time between midnight and 5 a.m. 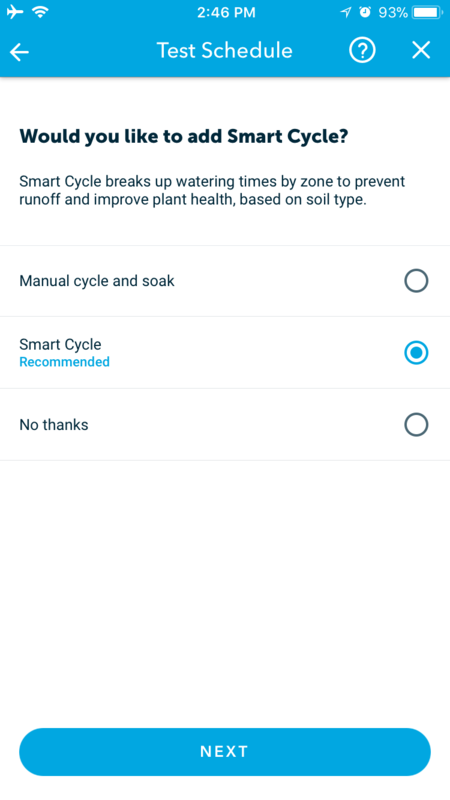 Ensure all Weather Intelligence skips are selected, then click “next” to confirm your watering durations and finish creating your schedule. You can confirm your selection in the Schedule tab. You can also get help right in the Rachio app by clicking on any of the question mark icons that appear (like the one in the upper left corner of the History tab). Have any questions or issues regarding your Rachio 3 Smart Sprinkler Controller? Check out the links below to learn more about the product or get in touch with the team.